So the other day, I received an email from someone who was interested in submitting a guest post on my blog. Although I had never done this before, I liked the idea so I asked them to submit a post in line with the topics on this blog, which primarily revolves around issues of faith and justice. What I got back was amazing! And so without further ado, I give you Faith.Hope.Love’s first guest post by Whitney Reed, owner of http://www.christiancolleges.org/. As we come to the end of Black History Month, I would like to share a brief history of a man who is seldom known by many, but who made a huge impact during the Civil War (both spiritually and politically). Hiram Rhoades Revels was a pastor and a Republican Party politician from Natchez, Mississippi. Although his impact and legacy to this world has a wide range, he is most notable for being the first African American to serve in the U.S. Congress. In 1866, the Civil Rights Act was passed. This politically mobilized the African American community who helped elect the Republican Party to power in the Southern states. 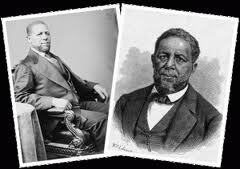 During this time, many African Americans were also being elected to several political positions, including Hiram Revels, who was first elected alderman in Natchez in 1868. He was then elected to the Mississippi State Senate in 1869. Elected to the Mississippi Senate on January 20, 1870, Revels actually filled the legislature seat that was once held by Jefferson Davis, the former president of the Confederacy. It has been said that an inspirational prayer, led by Revels in the Mississippi State Senate Chamber in 1870, helped him win the United States Senate seat that same year. When Mississippi was readmitted to the Union on February 23, 1870, Revels was sworn in as the first African American congressman two days later (February 25, 1870). While serving in the U.S. Senate, Revels worked on both the Committee of Education and Labor and the Committee of the District of Columbia. Although his term only lasted one year (he resigned to become the President of Alcorn State University in Mississippi, the first land-grant school for black students in the U.S.), Revels spent that year promoting equality for all men; he was vocal about his dislike for a proposed amendment that would keep the schools of Washington, D.C., segregated and he fought for African American worker rights. His nomination of a black candidate for admittance to the U.S. Army Military Academy at West Point is a great example of just how fearless and determined Hiram Revels was. West Point had long been a place that only accepted white candidates, so when he nominated this young man in May 1870, there was much talk in the public. The youth was blocked from entrance. Although he was not very successful in convincing Congress to enact more laws for social justice during his year as a U.S. Senator, Revels still made a huge impact by being one of the original leaders for freedom and equality. He was one who lived his life by faith and knew the power of standing up for what you believe in. Before he became a U.S. Senator, Revels served as the pastor for an African Methodist Episcopal Church in St. Louis. This happened even though Revels was born a free man, and Missouri had a law that forbade free blacks to live in the state. Eventually, Revels was arrested for preaching to the black community. Once released, he moved to Baltimore, Maryland, where he preached at a Presbyterian Church and served as the principle of a black school. When the Civil War broke out, Revels helped recruit two black regiments in Maryland. In 1862, when black soldiers were permitted to fight, he traveled with a black regiment for war campaigns in Mississippi and served as their chaplain. In 1863, he returned to St. Louis, where he founded a freedmen’s school. He also continued to preach the gospel at churches in Kansas, Indiana, Illinois, Kentucky, Tennessee, Louisiana and Mississippi. After living a life full of determination, Hiram Rhoades Revels died on January 16, 1901, while attending a church conference in Aberdeen, Mississippi. Let us remember the impact that Hiram Rhoades Revels had on the history of social justice in the United States. He is a great example of faith in action and staying true to what you believe is right.